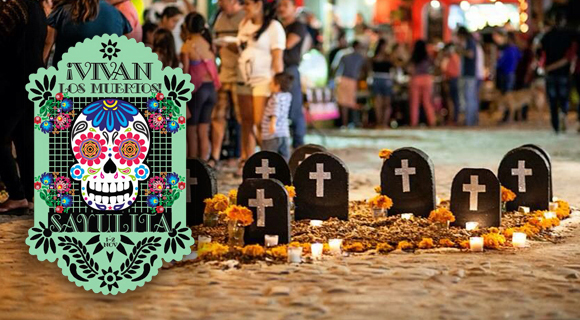 The main plaza of the Riviera Nayarit’s Surfing Capital will be bustling with artistic and cultural activities, among them a parade that will start there and wind its way to the cemetery where they will serenade the dead. Intent on preserving traditions, Sayulita is preparing to celebrate its 5th Day of the Dead Festival starting October 31 through November 2, 2016. The invitation is open to all—this will be the largest festival of its kind in the Riviera Nayarit. Right now Sayulita is a riot of color as it prepares to celebrate this tradition, which is what they seek to preserve. It’s well known that Sayulita is a multicultural town, one where they also celebrate Halloween, as they do in many parts of Mexico. But one of the intentions of the festival is for foreign visitors to the Destination to also celebrate the Day of the Dead. Starting at 9 p.m. on October 31st, escaramuzas (horsewomen) dressed as skeletons will take to the streets to signal the start of the activities. The altars will be installed on the main plaza On Tuesday, November 1st at 4 p.m., all of which will compete for prizes. After blessing the event with a mass on the plaza the activities begin with all the village schoolchildren presenting dances, plays and much more. That night the mariachi will arrive at 10 p.m. to begin harmonizing; at midnight they will lead the famous parade over to the cemetery to serenade and celebrate the dead. Once at the cemetery the mariachi songs will be joined by banda music. On the morning of Wednesday, November 2nd starting at 10 a.m. there will be a children’s workshop on the plaza where the kids can paint their own little skulls to help promote the tradition. The cultural events begin once again at 5 p.m. with a special presentation of the Ballet Mexcaltitán. The winning altar will be announced at 10 p.m. followed by a big party open to the general public. For more details visit: https://www.facebook.com/5tofestivalSayulita/?fref=ts.